Free ABN, $49 BAS and $99 income tax returns. Sign up for free and pay when you lodge. Import your information directly from your other accounts with our connected data sources. Airtax was founded by PwC in 2016 and designed by certified accountants so you can be confident that your tax is being handled by specialists. We show you average expense claims, and prompt you to claim deductions you may have missed, helping to optimise your BAS. Create an account with Airtax. You'll need to enter a few tax details to get started. Then you're ready to lodge your quarterly BAS and annual income tax return. 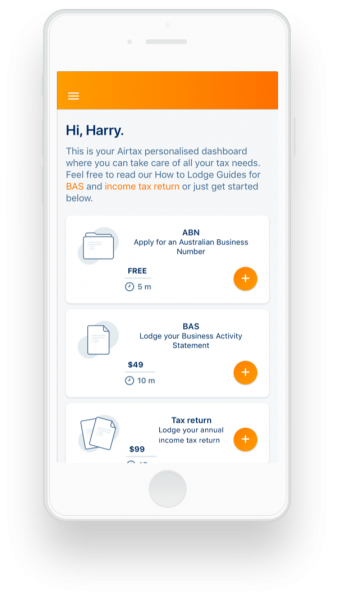 Airtax connects to QuickBooks Self-Employed, Square, the ATO and Rounded to prefill your income and expenses are prefilled. Apply for an ABN with Airtax for free (we'll also register you for GST if relevant). Don't worry, we'll help you to work this out when you sign up with Airtax. Just follow these simple steps and you'll be ready to start freelancing in a few minutes. "Airtax makes the process so simple and painless. The fee is easily worth the time saved correlating the information on my own"
With Airtax, tax has never been easier. Let us do the hard work for you.